Traditional Celtic music on harp and bagpipes. Jo and Wayne Morrison are Port Righ, a duo pairing Celtic harp and bagpipe and specializing in Scottish music. The duo specializes in Scottish music and has spent a great deal of time in Scotland absorbing the sights, sounds, and nuances of the culture, lending authenticity to their unique sound. Port Righ ("Port Ree") is the Gaelic name for the town of Portree on Scotland's Isle of Skye. It is usually translated as "king’s port" but may also be translated as "king’s music." Since the Celtic harp and the bagpipes were both historically used to entertain kings, the name seems fitting for this unusual group. Jo is internationally known for her evocative interpretation of Scottish and Irish music on the harp. Having spent two months in 2005 writing music, teaching, and performing on the Isle of Lewis in Scotland, her knowledge and understanding of the Celtic genre puts her in great demand as performer, adjudicator, and teacher across the country. Jo's music has been captured on her four critically-acclaimed recordings, ranging from solo harp favorites (By Request) to a multi-instrumental showcase of the music of Scotland (A Waulking Tour of Scotland.) Jo has been described by music critic Pamela Murray Winters as having "the freshness and grace that first gave Celtic music its power;" and Chuck Lipsig from Green Man Review's Best of 2000 listings states "Jo gets more out of the harp than should be possible." In addition to playing the Highland bagpipe, Wayne also performs on the shuttle pipes, the Highland pipes' quieter cousin. Wayne also brings concertina and impassioned vocals to the duo's wide mixture of Celtic sounds. 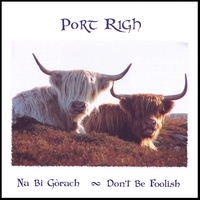 The duo's first CD, Na Bi Gòrach – Don't Be Foolish, was released in April of 2007. The duo has performed concerts at locations such as the Library of Congress, Somerset Harp Festival, the Smithsonian, various Scottish Festivals around the United States and also in Scotland, Ireland, and Germany. Their commitment to a traditional style gives them a sound comfortable both in today's modern society and also fitting for Renaissance festivals, historic sites, and other re-creationist events. “Morrison is at ease with this authentic Celtic music, and lends to it a sense of honest exuberance I find refreshing.” -- The Harp Column. When not performing, Wayne and Jo share their knowledge and love of the music with others as instructors at Common Ground on the Hill, a traditional music and arts center in Westminster, MD. They believe strongly in the Common Ground conviction that we can come to a greater understanding of other cultures through the sharing of music and arts. I purchased this haunting CD because I love Celtic music. The Morrisons superb combination of small pipes and harp is a must have for anyone who appreciates Celtic traditin. I highly recommend this CD.